Dermatoglyphics comes from two Greek words (Derma = skin; Glyphe = carve). Dermatoglyphs are the patterns of the skin ridges on pads of fingers which constitutes a person's fingerprints. These are also present on palms, soles, and toes. Each person has a unique set of fingerprint which helps to identify them. Dermatoglyphs consist of alignment of sweat gland pores and they are shaped in the first trimester of gestation, thus forming during the 6–7th week of the embryonic period and completing after 10–20 weeks of gestation. The basic patterns are whorls, arches, and loops; however, the size, spacing, and shape give them their distinct personality. These factors seem to be influenced by genetic factors. Multiple genes may be involved in this process, and the genes coding for the development of various layers of skin as well as the ones controlling the muscle, fat, and blood vessels beneath the skin may play an important role. However, other than genetic factors, the skin ridges are also influenced by the environment in the womb. Thus, identical twins, who have the same DNA, have different fingerprints. The ridged skin is considered to be a sensitive indicator of intrauterine dental anomalies because it originates from the same ectodermal layer as the teeth. Hence, when an intrauterine dermal damage occurs, a tooth anomaly can be expected. Periodontitis was initially thought to be strictly environmental in origin. However, the differences in disease variation could not be attributed to environmental factors alone. They may be due to difference in susceptibility of an individual, which could be attributed to the genetic make up. There is some literature pointing toward the genetic etiology of periodontal disease. Twin study by Michalowicz et al. of reared – together and reared – apart adult twins was conducted to eliminate the influence of environmental factors in causing chronic periodontitis in genetically similar adults and found that 38%–82% of variance could be attributed to genetic variation. Moreover, there was no difference between reared – apart and reared – together monozygotic twins suggesting that family environment had no significant influence on the clinical parameters of the disease. Goteiner and Goldmanfound human leukocyte antigen-B5 Ag to be more prevalent in adults resistant to disease. Kornman et al. studied genetically determined polymorphism in interleukin-1 (α and β), tumor necrosis factor-α, CD14 promoter region and shown them to be risk factors for chronic periodontitis. However, still, the genetics of susceptibility to inflammatory periodontal diseases have remained elusive. Atasu et al. conducted a study with the aim of finding a finger-tip pattern type that would identify the patients with periodontal diseases. The finger-tip palm and sole prints of juvenile periodontitis (JP), rapidly progressive periodontitis (RPP), and adult periodontitis (AP) were compared with those of periodontally healthy (PH) individuals. They concluded that there was a decreased frequencies of twinned and transversal ulnar loops on all fingers of the patients with JP, decreased frequency of double loops on all fingers and an increased frequency of radial loops on the right second digits of the patients with RPP and an increased frequency of concentric whorls and transversal ulnar loops on all fingers of the patients with AP an increased frequency of the tri-radii on the palms and soles of the patients with JP were found. Various authors have conducted studies to interpret irregularities in dermatoglyphic patterns in varied disorders to establish a genetic basis and hence to make way for early detection and prevention. In a study by Sharma and Somani, the patients with dental caries had positive correlation with the loops (decreased frequency of loops) and streptococcal mutans growth. In a study conducted by Saxena et al., 294 participants (48 cleft participants and 50 healthy controls with both their parents) were evaluated, and they found increased frequency of loops and arches and low mean total ridge count in cleft participants. They also found increased frequency of loops and arches with decreased frequency of whorls and mean total ridge count in parents of cleft group as compared with the parents of the controls. The research regarding dermatoglyphics in the periodontal field is still in its infantile stage. Hence, if such a relationship is established between finger prints and periodontal diseases due to both their roots in genetics, early detection can aid the clinician to anticipate health problems in children and initiate preventive and protective health measures at the earliest. 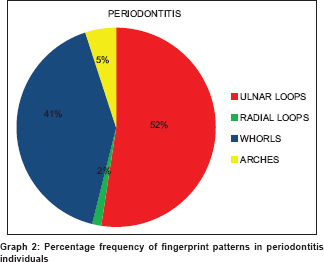 Thus, the aim of the present study was to assess the relationship between finger prints and chronic periodontitis. Radial loop composed of ridges that open on the radial side. The diagnosis of chronic periodontitis was established according to the American Academy of Periodontology 1999 classification based on the measurements of attachment level, probing depth, bone loss, and/or degree of inflammation. Health was defined as concurrent absence of these signs and symptoms. Patients were then accordingly divided into two groups, i.e., chronic periodontitis and PH. 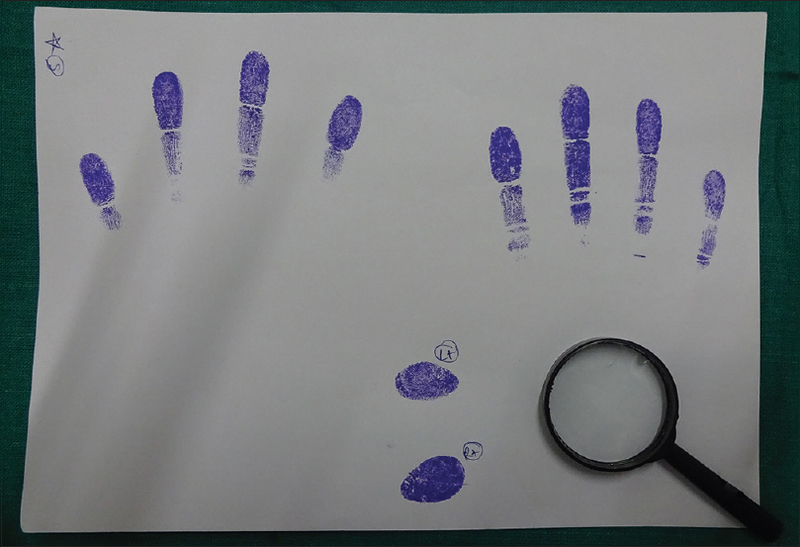 The fingerprint patterns of the participants were recorded with a rolling impression technique using duplicating ink on executive bond paper [Figure 2]. All ten fingerprints of a single subject were studied under adequate light and magnification and classified into three basic types according to shape, i.e., whorls (ridges make a turn through one complete circuit), loops (ridges run from one side to another with a backward turn), and arches (ridges run from one side to another making no backward turn). The descriptive analysis of the data was presented as percentage frequency. Percentage frequencies of each pattern on each individual finger were calculated. The intergroup data were analyzed statistically using unpaired t-test, and the level of significance was set at P ≤ 0.05 with a confidence interval of 95%. The percentage frequencies of all pattern types on fingertips of patients with chronic periodontitis and PH were assessed [Table 1]. It was found that in healthy controls, there was highest prevalence of ulnar loops (62.4%) followed by whorls (21.3%), arches (14.6%), and radial loops (1.7%). The prevalence pattern was similar for patients with chronic periodontitis, however, the prevalence of ulnar loops reduced to 52.4%, radial loops to 1.5%, and arches to 5% whereas the prevalence of whorls increased to 41.1%. 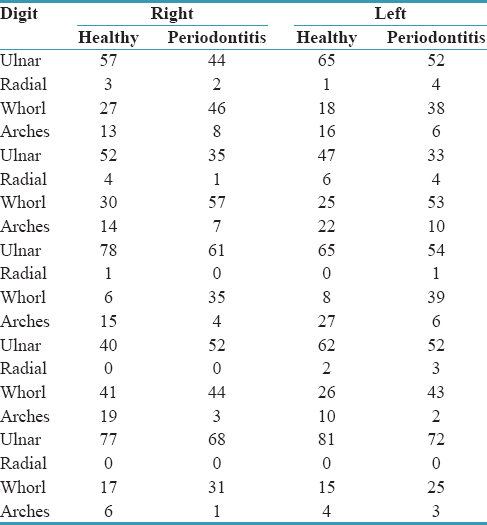 The percentage frequencies of all pattern types on individual fingertips of patients with chronic periodontitis and PH were assessed [Table 2]. 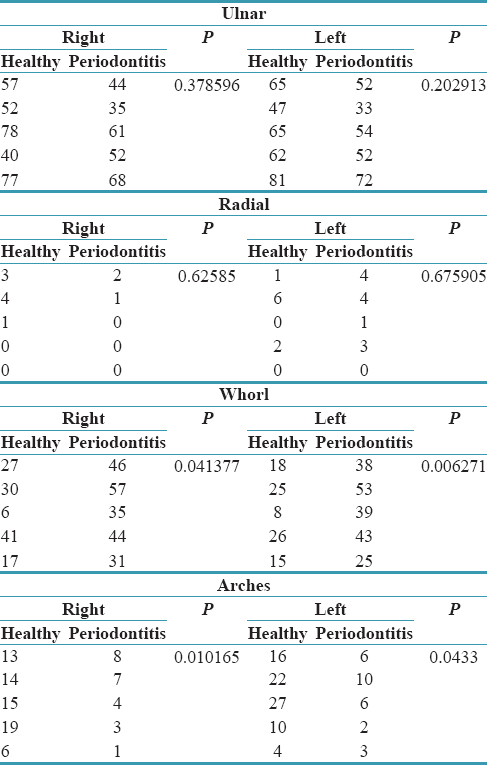 It was noted that the highest prevalence of whorls was found on the second digit as compared to the other digits in the group with periodontitis. [Table 3] show unpaired t-test applied on the above data, and it was found that the periodontitis group showed statistically more whorl patterns in both right and left hands. The number of arches was statistically less in periodontitis group in both the hands as compared to healthy controls. Through decades of scientific research, the hand has come to be recognized as a powerful tool in the diagnosis of psychological, medical, and genetic conditions. The major advantages of the dermatoglyphics are that they are fully developed at birth and thereafter remain unchanged for life. In addition, the scanning and recording of their permanent impressions can be done rapidly, inexpensively, conveniently, and without causing any trauma to the patient. 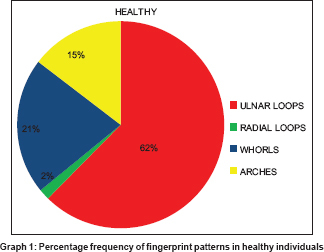 In the present study, it was found that the most common fingerprint pattern among PH was loops, i.e., individuals had either radial or ulnar loops [Graph 1]. There was an overall more percentage frequency of the whorl pattern in patients with chronic periodontitis [Graph 2] which was statistically significant. In addition, there was a significant decreased frequency of arches on both the hands. In contrast to the study by Atasu et al., increase in transverse ulnar loops was not present in patients of chronic periodontitis in our study. The above results can be explained on the basis of embryonic development of the skin ridges and the periodontium. Both skin ridges and the enamel organ of the developing tooth bud have an ectodermal origin. The embryonal skin is made up of epidermis on top of the dermis layer, in which the innermost layer of epidermis is called basal layer. Later, this basal layer becomes undulated, and as it becomes more prominent, it forms folds of the epidermis into the dermis. These folds are called primary ridges. Kücken and Newell  suggested that a buckling instability taking place in the basal layer due to its differential growth pattern and the constraint from the surrounding epidermis and dermis maybe the cause of skin ridge formation. They also suggested a role of nervous system in the ridge formation stating that the nerves induce forces that pull in the epidermis and creates the folds. Thus, the genes coding for the layers for the skin, the amount of buckling instability, the pattern of nervous system, and various other factors determine the individualistic set of fingerprints. Teeth develop from oral epithelium and neural crest derived mesenchyme. The epithelium invaginates into the surrounding mesenchyme and forms a dental bud. Later, the epithelial cervical loops grow further into the condensed mesenchyme forming a cap and then a bell shaped enamel organ. The remaining condensed dental mesenchyme surrounding the outer enamel organ and dental papilla gives rise to the dental follicle, which later forms the periodontium: cementoblasts, periodontal ligament, and alveolar bone. At the bell stage of tooth development, the dental follicle, or dental sac, is clearly divided into three layers: the inner layer adjacent to the outer surface of enamel organ and dental papilla, the outer layer adjacent to the developing alveolar bone, and a less densely populated intermediate layer separating the other two. The inner layer is probably the most important part of the dental follicle for the formation of cementoblasts and periodontal ligament. Just like the enamel-dentin formation, the epithelial-mesenchymal interactions are required for follicle cells to function as cementoblasts, osteoblasts, or periodontal ligament cells. It may be hypothesized that proteins derived from enamel, for example, amelogenin and/or ameloblastin, may be involved in regulating follicle cell maturation and/or transformation of epithelial root sheath cells into cementoblasts hence suggesting the importance of enamel organ in the development of the periodontium. Thus, it can be proposed that disturbance in the ectodermal layer may manifest itself in both the development of skin ridges and the tooth with its periodontium and create a link between dermatoglyphics and anomalies of tooth and periodontium. Dermatoglyphics could be used together with the other diagnostic methods such as clinical and radiographic investigations in identifying patients with distinct group of periodontal disease. Early detection can lead to early prevention in young age. Thus, even the participants of the healthy group that showed similar frequency of dermatoglyphic patterns like those of chronic periodontitis can be considered susceptible to the disease in the future and can take preventive measures. It is cheaper and easier than many genetic susceptibility tests, i.e., 1 set of print holds answers to various genetic dysfunctions. The limitations of this study were that only patients with chronic periodontitis were evaluated. Various periodontal diseases including aggressive periodontitis that is known to have a genetic basis and familial aggregation were not included. However, further studies must undertake different forms of periodontal diseases in a larger population to confirm the suggestive link. The study was also retrospective in nature. A prospective, longitudinal study would help determine whether fingerprints are actually markers for disease susceptibility. In future, the genetic basis of this proposed link can be established, however at present, no such studies have been conducted, and hence, the link between the two can only be suggested by utilizing our knowledge on the embryologic development. Fingerprint patterns are genotypically determined and remain unchanged from birth till death. Recording of fingerprints is easy, cheap, and noninvasive; thus making it a very “user-friendly” tool. Dermatoglyphics can lead to early diagnosis, treatment, and better prevention of many genetic disorders of the oral cavity and other diseases whose etiology may be influenced directly or indirectly by genetic inheritance. More studies with a diverse and larger population need to be conducted so as to make dermatoglyphics a reliable diagnostic and screening tool. Thus, dermatoglyphics should be incorporated by dental professionals and researchers for more studies on oral cavity leading to many more new discoveries. Sharma A, Palvi, Kapoor D. Dermatoglyphics, dentistry and diagnosis-a review. Baba Farid Univ Dent J 2010;1:45-8. Bhat GM, Mukhdoomi MA, Shah BA, Ittoo MS. Dermatoglyphics: In health and disease-A review. Int J Res Med Sci 2014;2:31-7. Ceena DE, Ahmed J, Shenoy N, Binnal A. Dermatoglyphics in dentistry-A review. Int J Cur Res Rev 2013;5:30-3. Goteiner D, Goldman MJ. Human lymphocyte antigen haplotype and resistance to periodontitis. J Periodontol 1984;55:155-8. Kornman KS, Crane A, Wang HY, di Giovine FS, Newman MG, Pirk FW, et al. The interleukin-1 genotype as a severity factor in adult periodontal disease. J Clin Periodontol 1997;24:72-7. Prabhu N, Issrani R, Mathur S, Mishra G, Sinha S. Dermatoglyphics in health and oral diseases-A review. JSM Dent 2014;2:1044-8. Ten Cate AR, Mills C, Solomon G. The development of the periodontium. A transplantation and autoradiographic study. Anat Rec 1971;170:365-79. Hakki SS, Berry JE, Somerman MJ. The effect of enamel matrix protein derivative on follicle cells in vitro. J Periodontol 2001;72:679-87.